For many years I’ve had a love of the Thames and a growing interest in archaeology so when the opportunity came along to combine both it was just too good to miss. I first heard of the Thames Discovery Programme through Richmond Archaeological Society and was keen to sign up straight away. I had already had some foreshore experience with RAS at Kew, Mortlake and Isleworth but the TDP promised to offer far more opportunities as it embraces the whole of the tidal Thames and can call on far more resources than a local society. Then three weeks later we had the opportunity for our practical training on the foreshore outside Custom House in Lower Thames St. The first thing that struck me here was the composition of the surface underfoot compared to that which I’d seen in suburban Isleworth. Comparatively rich deposits of clay pipe stems, many different types of animal bones and thousands of oyster shells all confirmed that this site was very different to what I’d experienced previously. 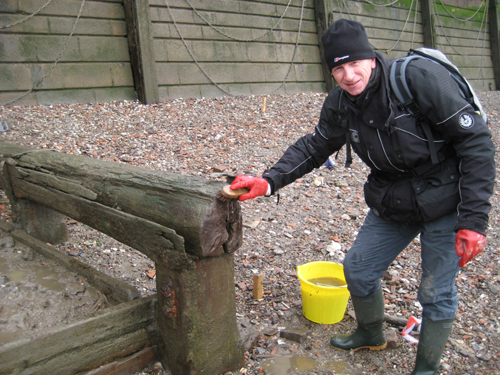 After a useful Health and Safety briefing by Nathalie we were allocated zones to work in, and professional archaeologists to work with, and I found myself with a group of 4 others working on a ‘grid iron’ – a framework upon which barges settle during low tides for maintenance. Our task being first to clean it up then to measure and record. All the equipment was supplied and I soon made myself busy cleaning mud and slime off a large wooden beam with a bucket and scrubbing brush. Useful tip – Don’t wear your finest clothing to FROG work parties! Despite the cold temperatures I was soon as warm as toast due to my exertions. During the morning we were shown other interesting features on the site other than our “own” and also had the opportunity to work with a dumpy to determine the exact location of features and how they relate to ordnance datum points– very much needed in my case, as it’s a weak spot of mine. Both days were immensely enjoyable not only in terms of what we’d all learnt and the relaxed but professional atmosphere in which we learnt it but also because we had the thrill of working alongside professional archaeologists in such a fascinating location. Why not join us and become a FROG on the Thames foreshore?